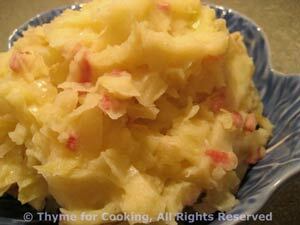 Colcannon, a mix of cabbage and mashed, Thyme for Cooking sides. 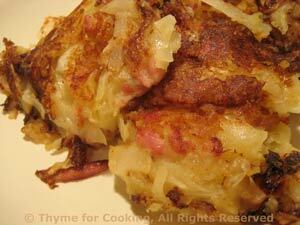 Similar to Mashed Potato Cakes, but easier and quicker to make. In a medium nonstick skillet melt 1 tsp butter over medium-high heat. Add half of the colcannon and pat it down evenly. Let sauté for 6 - 7 minutes until crisp and brown on the bottom. Using a spatula, turn the colcannon over carefully so the crispy side is up. It's not necessary to keep it together; do it in sections. As you are turning it put 1 tsp butter underneath the sections. Once it's all turned pat it back together. Put the remaining half of the colcannon on top of the browned side in the pan, spreading it out and patting it down. Let sauté for 6 - 7 minutes until bottom is crispy and brown. Now turn this over, adding the remaining tsp of butter and doing it in sections. Pat it together and let sauté 6 - 7 minutes. When done on the bottom again, slide it onto a plate and serve.